Alice: Where Are We Now? The four years since Alice Corp. Pty. Ltd. v. CLS Bank Int’l, 134 S. Ct. 2347 (2014) have seen thousands of patents invalidated based on its holdings. In an update to our Alice: Three Years On review of the patent landscape, we look to see where Alice has had the greatest impact within the USPTO. Before getting into the data, we wanted to give a brief update of where the Alice jurisprudence stands today. Alice has been criticized for creating confusion as to what qualifies as eligible subject matter, as well as for its ill-defined second step that looks for "something more" to lift otherwise abstract ideas over the patentability hurdle. Confused? You’re not alone. Even the USPTO’s own Patent Public Advisory Committee 2018 Annual Report suggests that some 32% of Alice rejections were improperly made or inadequately explained. These questionable Alice rejections highlight the ongoing confusion among examiners, practitioners, and even within the courts. Luckily, there are resources that can help orient us in Alice’s wonderland. Fish and Richardson maintain an excellent Alice case tracker, and other firms’ treatments of Aatrix v. Green Shades Software, Berkheimer v. HP, Bascom Global Internet Services, Inc. v. AT&T Mobility LLC, AT&T Corp., Core Wireless Licensing v. LG Electronics, Secured Mail Solutions LLC v. Universal Wilde, Inc., Visual Memory LLC v. NVIDIA Corporation, Thales Visionix, Inc. v. The United States, and Enfish, LLC v. Microsoft Corporation, et al. are also very helpful. We see some common themes emerge from these cases. First, and perhaps stated most clearly in Enfish, it seems that the courts focus on whether there is a functional improvement to the invention in relation to the “abstract idea” in question. If the courts see that this functional improvement is significant enough to otherwise stand on its own as a claim, then the idea is then no longer “abstract” in the courts’ eyes. This satisfies Alice at step one and concludes the courts’ analysis. These cases also shed more light on articulating the "something more" in Alice's second step. Bascom makes clear that the novel or unconventional arrangement of otherwise generic elements can be enough to overcome Alice. Also, Core Wireless solidifies the intuition that presenting a claim as a solution to a defined problem can resolve Alice concerns. Since the step two question is a factual inquiry after Berkheimer and Aatrix, even well-understood processes and abstract ideas can be patent eligible if the claims and specification follow the lead set by Core Wireless and Bascom. Amidst the general confusion over how to deal with Alice in the first place, the Federal Circuit also seems to affirm Alice rejections at a higher rate than rejections in general, creating a double threat for patent prosecutors. Fortunately, the USPTO recently released a Quick Reference Sheet that more fully describes the kinds of abstract ideas that examiners will generally reject on Alice grounds. While this should make it easier for practitioners and inventors to understand and navigate the Alice danger zones going forward, we took a look back at how Alice rejections have played into the patent landscape over the last four years. Unsurprisingly, the frequency of Alice rejections each quarter grew steadily in the decision's wake and rose sharply in Q1 2015 after the USPTO’s first Alice guidances to examiners took effect. Since then, Alice rejections have continued to climb, accounting for nearly 85% of all §101 rejections in Q4 2017. What is surprising is how much more of the overall rejection picture Alice rejections are beginning to make up. 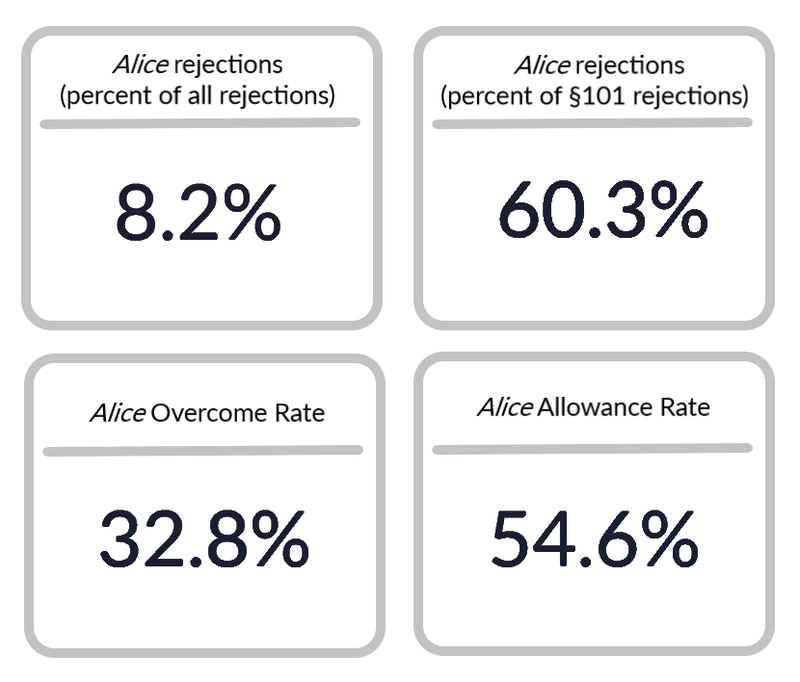 Since 2016, Alice rejections have risen from less than 10% of all rejections to nearly 17% by the end of 2017. We think there are two main factors at play here. First, Alice expanded the grounds that an examiner could use to articulate a rejection, making it easier to reject applications. Second, Alice brought increased scrutiny to a group of patents that may have been allowed before Alice, expanding the number of applications at risk of a §101 rejection. We think these two factors together may explain why Alice rejections are contributing to a larger percentage of §101 rejections and of all rejections in general. The data in this section covers identified §101 and Alice rejections across the entire USPTO from July 2014 - July 2018 (except the Tech Center graphic, which shows data from July 2014 - December 2017). Juristat’s dynamic database means that these precise numbers may change as more data becomes available. Alice clearly does not impact all technologies equally. When we look at USPC classes that have issued at least 50 Alice rejections, the top 10 classes with the highest percentage of Alice rejections are clearly concentrated, with six of the 10 covering different kinds of Data Processing (705, 702, 703, 708, 704, 706). Of these, Class 705 fares the worst, with 82.2% of all rejections citing Alice. This concentration may not be as surprising considering that the patents at issue in Alice itself (application numbers 08/070,136; 09/567,507; 10/331,331; 11/166,387) were all in Class 705. The other four classes are diverse, covering Education and Demonstration (434), Computer Aided Design and Analysis of Circuit and Semiconductor Masks (716), Amusement Devices (463), and a combinatorial Chemistry Technology class (506). These classes may all fit into the Alice picture as “do-it-on-a-computer” rejections. When we apply the same criteria to art units, the concentration is even more clear, with every one of our top 10 in a Business Methods or Electronic Commerce art unit. This may again be unsurprising as two of the initial Alice patents were in AU 3624 and one in AU 3693 (the fourth was in an art unit group that has since been abolished). When it comes to technology centers, TC 3600 is broadly believed to have a disproportionate share of Alice rejections. And in fact, based on our most recent analysis, TC 3600 does account for more than 44% of all Alice rejections across the USPTO, more than the next three tech centers combined. Since Q2 2015, Alice has consistently accounted for more than 90% of TC 3600’s §101 rejections and approximately 28% or more of all rejections in the tech center overall. But looking beyond TC 3600, it’s also interesting to see where Alice rejections as a proportion of §101 rejections have been growing. As you can see in the graph below, Alice rejections in TC 2100 have been growing at a rapid pace, accounting for 92.6% of all §101 rejections in Q4 2017. The data in this section covers identified §101 and Alice rejections across the entire USPTO from July 2014 - July 2018. Juristat’s dynamic database means that these precise numbers may change as more data becomes available. Alice rejections certainly make prosecuting patents more difficult. Even though Alice rejections comprise just 8.2% of all rejections at the USPTO, it is cited in more than 60% of §101 rejections. When it comes to beating Alice rejections, prosecutors only overcome the rejection on the first try 32.8% of the time. Persistence and preparation do seem to make a difference, as more than 54% of applications that see an Alice rejection are eventually allowed. Four years later, and Alice is still a significant part of the patent landscape, with outsized effects in technology areas that rely on computers, data processing, data transmission, and algorithmic innovations. Courts and the USPTO are still working to clarify how to interpret and apply Alice, leaving patent drafters and prosecutors with ambiguous guidance. Practitioners can reduce some of that ambiguity by leveraging data to make strategic decisions. Know your examiner’s behavior. Knowing how an examiner has applied Alice in the past can help you prepare for a more successful prosecution. Juristat’s Examiner Reports detail each USPTO examiner’s rejection history, allowance rates, and more to help tailor a prosecution strategy to meet your examiner’s unique preferences. Predict which class you’ll land in. Based on our analysis, it’s clear that some classes are hotbeds for Alice rejections (hello, Class 705!). Juristat’s Drafting tool can identify your application's likely class, art unit, or tech center assignments, helping patent professionals plan a potential response strategy. Manage client expectations. While patent professionals may be well aware of the risks of an Alice rejection, clients aren’t always prepared. Patent analytics make it possible to communicate and set expectations with clients before getting too deep in a costly prosecution. Juristat’s database of more than 10 million patent applications and their prosecution histories puts the whole USPTO at your fingertips, helping you identify applications that may be vulnerable to an Alice rejection. Equip yourself with the tools to overcome Alice by signing up for a demo. Subscribe to the latest news and insights from Juristat.